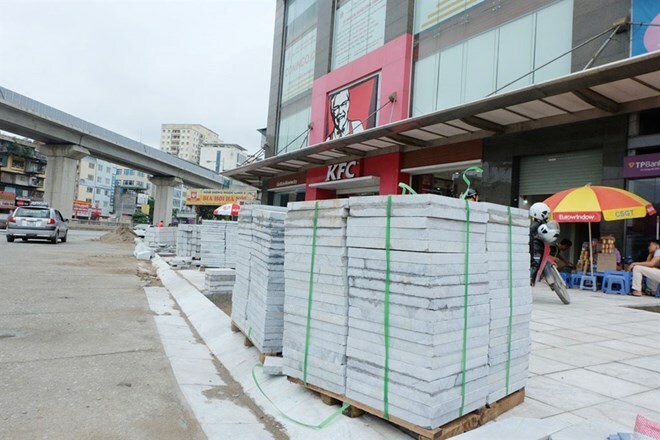 Hanoi (VNA) - The pavement of about 100 streets in Hanoi will be replaced with natural stones this year instead of conventional concrete bricks. The natural stones will be used along streets where electrical wires and telecommunication cables are buried underground. For example, some eligible streets in Ba Dinh District include Chu Van An, Nguyen Canh Chan, Hoang Van Thu, Le Hong Phong, Tran Phu, Hoang Dieu and Nguyen Thai Hoc – Kim Ma. Dong Da, Tay Ho, Hai Ba Trung, Hoan Kiem, Hoang Mai and Ha Dong districts will also have streets with natural stone pavements. The city People’s Committee asked relevant agencies to select proper materials and identify the origins of stones that will be used. Terrazzo tiles and concrete bricks will also used for other pavement along streets in the city. By the end of 2016, many inner districts in Hanoi started resurfacing work on existing “degraded pavements” with slabs of natural stone that authorities claimed would be “sturdy for the next 50-70 years”. The city planned to repave 936 streets in 12 districts by 2020 as a measure to enhance the appearance of the city.